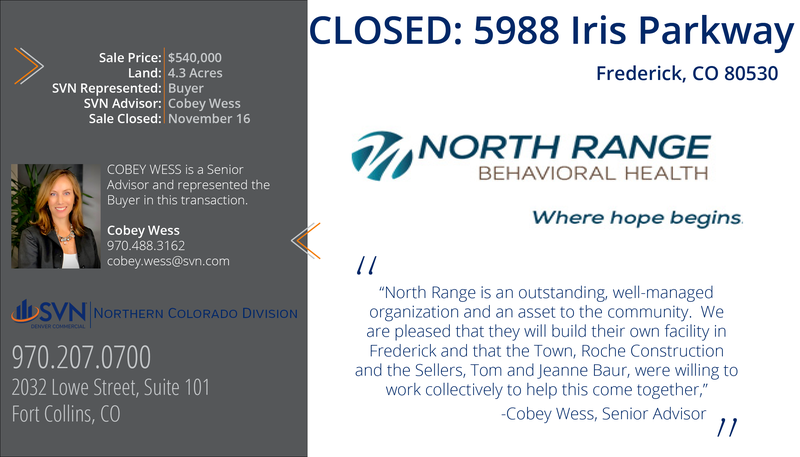 Frederick, CO, November 16, 2018, 2018 SVN | Denver Commercial (Northern Colorado Division), one of Colorado’s top producing real estate investment brokerage firms, is pleased to announce a 4.3 acre land purchase by North Range Behavioral Health for a new facility in Frederick. North Range Behavioral Health will construct a facility that offers outpatient mental health and substance use disorder treatment for children, youth, and adults. “North Range has served the Carbon Valley area since 2015 with an outpatient office at the Indian Peaks Medical Center,” says Larry Pottorff, North Range Executive Director, “but as the population and needs of this area have grown, we recognized that it was time to build a larger facility”. North Range currently has offices at Indian Peaks Medical Center and hopes to expand the new Frederick campus to include additional treatment programs. North Range Behavioral Health serves people with insurance, Health First Colorado (Medicaid), Medicare, CHP+, those without insurance, and those who prefer to pay out-of-pocket. “North Range is an outstanding, well-managed organization and an asset to the community. We are pleased that they will build their own facility in Frederick and that the Town, Roche Construction and the Sellers, Tom and Jeanne Baur, were willing to work collectively to help this come together,” said Cobey Wess, a Senior Advisor with SVN and the buyer’s agent.